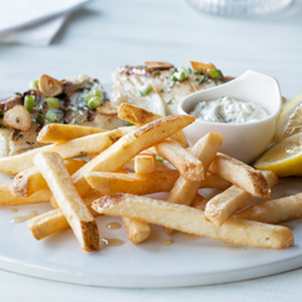 With natural appeal and back-of-house flair, Select Recipe® fries are perfectly flavored with real sea salt and a variety of appetizing flavors. Offer as a side or a starter. Natural good looks and premium length make for plate appearance that delights customers before they even dig in. Our chef-crafted recipe uses real sea salt and other natural ingredients that deliver a one-of-a-kind taste experience. Select Recipe fries took top honors in a nationwide, in-operation placement test for hold, texture, and overall preference. Skin-on or skin-off, Select Recipe® fries are available in a variety of natural-looking cuts and styles and are ready to delight customers as a perfect side or appetizer. 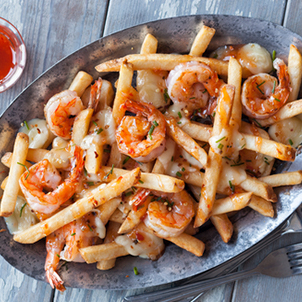 Put an American spin on poutine with Select Recipe fries, shrimp, sweet chili sauce, and pepper jack cheese. Serve as an unforgettable appetizer. Add garlic and cracked pepper to Select Recipe fries. Or use minced garlic, butter, and parsley for even more shore-style taste. Serve as a side or appetizer. 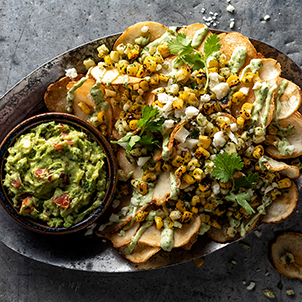 Serve up Select Recipe Chips topped with a zesty avocado sauce featuring RoastWorks® Flame-Roasted Corn & Jalapeño Blend. Fill out the form below to order your free sample. Once you’ve submitted the form, a Simplot Foods representative will contact you. © 2019 J.R. Simplot Company The foregoing trademarks are owned by the J.R. Simplot Company.